MOAS raises serious concerns over the funding of essential services for Rohingya refugees in Bangladesh and its consequences during the monsoon season. The Joint Response Plan (JRP) for 2018 requested around 951 million US Dollars to fund everything from food security to flood protection. However, according to the latest ISCG summary, only 26% has been raised so far. The Emergency Telecommunications Service, a vital sector during the monsoon and cyclone period, has reached 70% of its target, with the 10 remaining sectors falling far behind. Healthcare and Communication With Communities are the most drastically underfunded sectors, with only 11% and 2% raised respectively. MOAS is concerned that without adequate health provision on the ground and a reliable means to broadcast important information about the risks and dangers of the monsoon season, there could be serious consequences. MOAS has been on the ground since September 2017, providing primary healthcare services to the residents of Shamlapur and Unchiprang refugee camps. We have also worked under the guidance of the WHO and the Bangladeshi Government on vaccination campaigns to inoculate Rohingya refugees against communicable diseases like diphtheria. A lack of funding for healthcare means resources will be spread more thinly, creating gaps at a time when response and treatment are becoming increasingly vital. Equally, the Rohingya community in Bangladesh is 80% illiterate and relies on the efforts of the Communication With Communities sector to broadcast messages about the monsoons. Without funding to better communicate the dangers associated with heavy rains and high winds, there is an increased chance of avoidable accidents and fatalities caused by extreme weather. The first signs of the monsoon season are clear to see and the dangers are real. 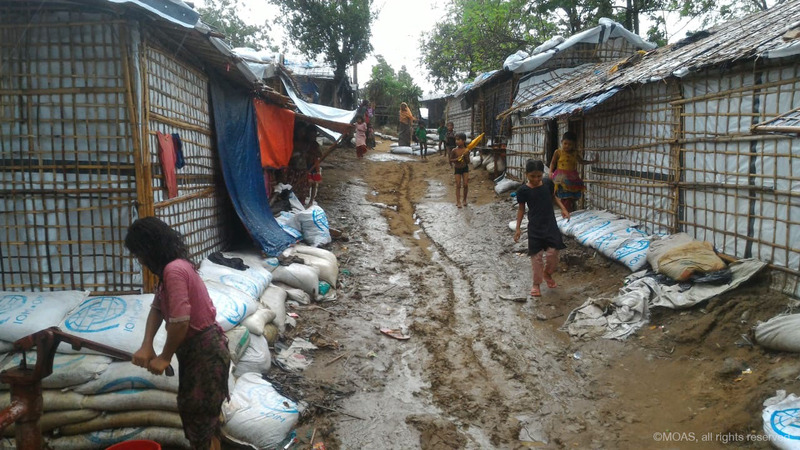 With improvements to funding, MOAS and the many organisations supporting the Rohingya in Bangladesh will be better prepared to ride out the storm.